At the request of the The TN Dept. 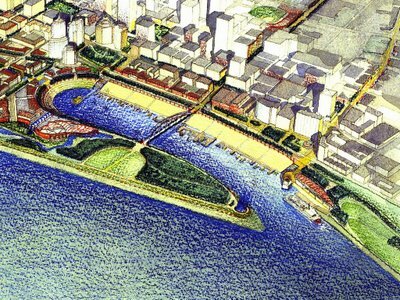 of Transportation (TDOT), FfOR sent suggestions about ways to avoid or minimize the negative effect of Beale Street Landing on the unique historic integrity of the Memphis riverfront. We did a little research and came across some earlier plans that, with modification, just might solve the problem – give us an exciting public space at the water level, restore the Cobblestone Landing, and provide a place for commercial and private boats to dock. Here is some background on the 106 process, FfOR’s letter to TDOT, illustrations of earlier designs, and links for more study. 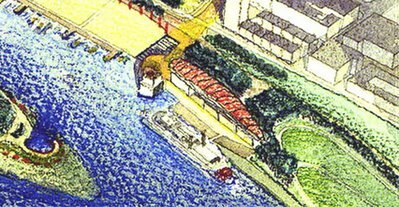 The Beale Street Landing project, as currently proposed, would be located within an historic district and would receive federal funding. As a result, federal law required that the project be reviewed by the Tennessee State Historic Preservation Office (TN-SHPO). 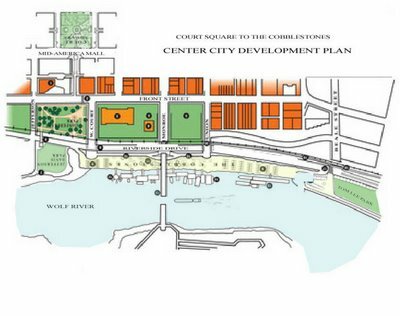 TN-SHPO determined that the proposed project would have a negative impact on the historic Cotton Row Historic District and Memphis Cobblestone Landing. The Cobblestone Landing is on the National Register and has been recommended for National Historic Landmark status. The TN Department of Transportation (TDOT), the state agency through which the federal funds would pass to Memphis, sponsored a consulting parties meeting in Memphis on Oct. 24, to discuss ways to avoid the adverse effects associated with the current design of Beale Street Landing. TDOT requested additional comments, and FfOR sent the following suggestions. Suite 700 James K. Polk Bldg. Friends for Our Riverfront supports the renewal of downtown Memphis and the restoration, preservation, and revitalization of the Memphis riverfront. 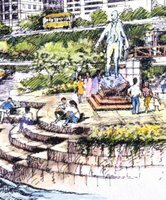 We are committed to protecting the uniqueness of our city’s spectacular site on the Mississippi River and to improving and making the public spaces along the River more user friendly. We have read and support the TN State Historic Preservation Office’s (TN-SHPO) finding that the Riverfront Development Corporation’s Beale Street Landing project, as proposed, will have a negative impact on the Memphis Cobblestone Landing, which is on the National Register and has been recommended for National Historic Landmark status. 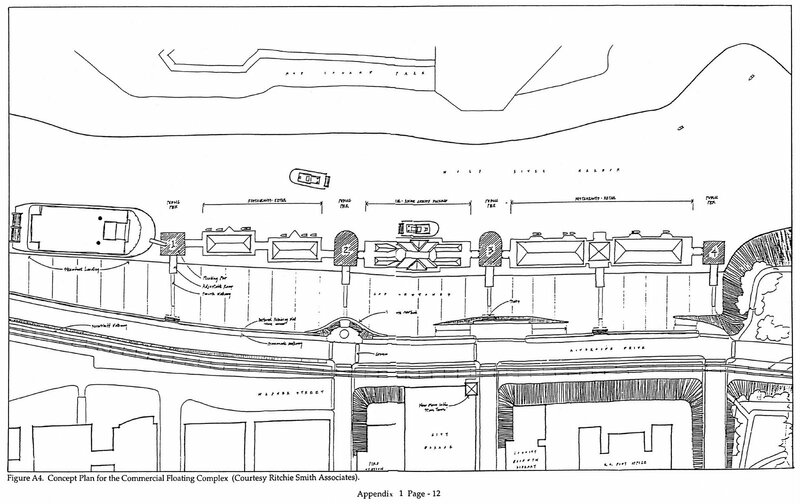 As discussed at the Tennessee Department of Transportation (TDOT) meeting in Memphis on Oct. 24 and as presented in the Tennessee State Historic Preservation Historic Office (TN-SHPO) report, Beale Street Landing as currently proposed would be (1) built on top of a section of the historic cobblestone landing and (2) would alter the viewshed, slope, scale, and character of the historic landmark and adjacent historic district. 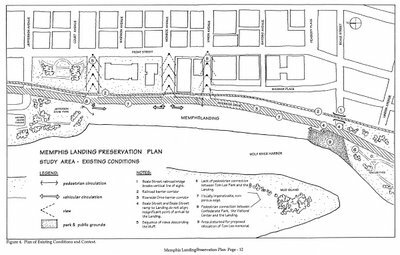 While the goal of providing a place for large riverboats to dock in the harbor at low water levels is an important consideration, it should be considered as part of the broader goal of restoring and reactivating the entire Memphis landing. 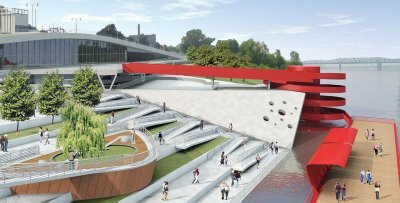 An alternative design should be considered that would both protect our cultural resource and provide a point of access for large riverboats at low water levels. The Cultural Resource Plan includes general planning standards (p. 17) and recommends design solutions (p. 19-37). Many of these can and should be applied to the Beale Street Landing Project. The issues of verticality, scale, grade, boat access, and commercial use are all addressed. 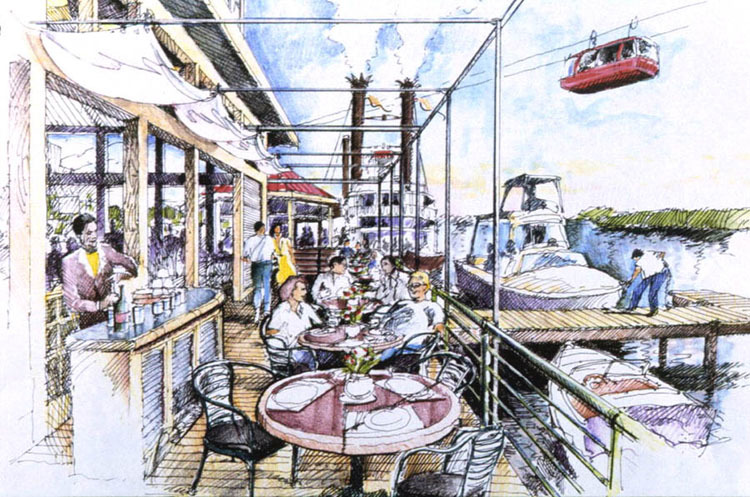 There is an illustration of how boats in the harbor can be used for restaurants and shopping. A point at the foot of Gayoso is suggested for docking large riverboats. 1. Based on the Cultural Resource Plan standards, the height and solidity of the wooden pods proposed for Beale Street Landing (some as tall as 35’) should be reconsidered and replaced by earthen and limestone or other appropriate rock terracing and walkways. The grade and slope should respect and adhere to that of the cobblestone landing. 2. The location of the landing point for the large riverboats and its size should be reduced to that presented in the 2002 Riverfront Development Corporation Masterplan and/or that presented in the 1995 Cultural Resources Plan. 3. 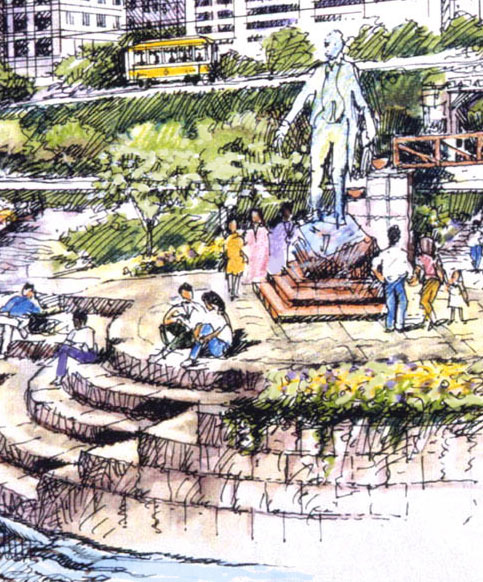 The new landing should not be built on top of the historic cobblestones, which extended to Beale Street. 4. The Memphis riverfront could best be addressed in an overall plan for restoration of the cobblestones and active use of the cobblestone landing rather than by reviewing two separate projects. 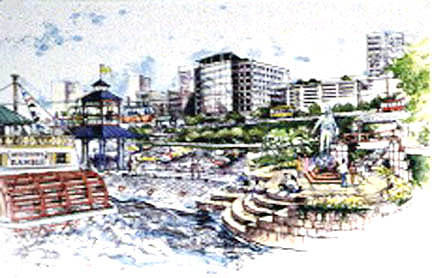 The Riverfront Development Corporation, in their masterplan, recognizes the cobblestone landing as “Memphis’ most treasured historic river resource.” The Cultural Resource Plan states that attention and activity should be focused on the cobblestones and that the stabilization of their western edge should be the top priority (CRP–2, page 19). It also says that in order to address accessibility issues “…it would be wise to link groups of new construction and alteration projects together as one…” (CRP-2, page 34). 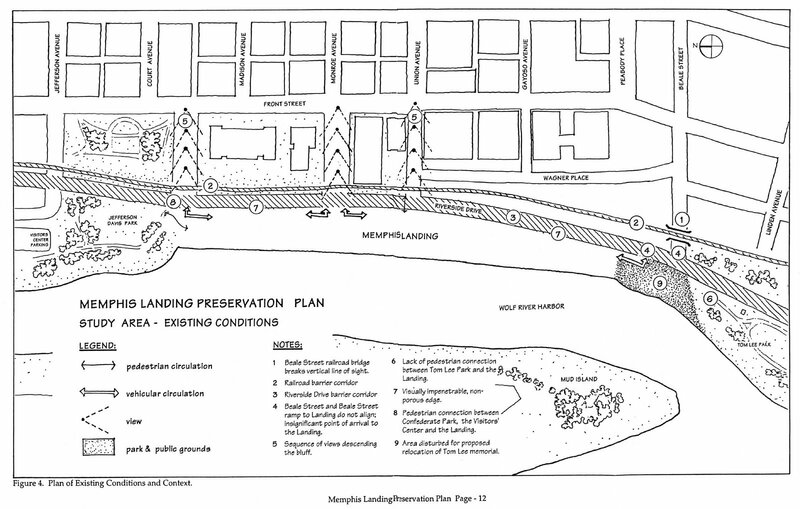 We suggest that in order to avoid any future conflicting uses and in order to protect and energize the historic cobblestone landing, the entire Memphis landing should be considered and planned for as a whole with the role and design of a landing at Beale Street viewed as one part of the overall design and use as recommended in the 1995 Cultural Resource Plan. The restoration of the paving and grade along the western edge of the Cobblestone Landing is critically important for the survival of this historic resource and should not be eclipsed by a subsection plan for a new docking facility. 5. Finally, because of their past involvement and familiarity with the important historic value of the Memphis riverfront and because of City’s continued neglect as well as the subsequent continued deterioration of the cobblestone landing, we request that the national Advisory Council on Historic Preservation be brought in as a consulting party on this project. Illustrations from earlier plans; click on images to enlarge. 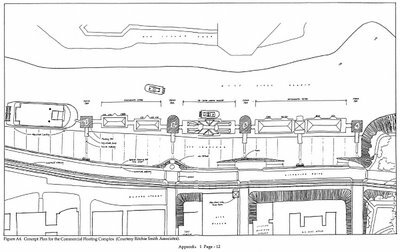 Earlier riverfront plans show restoration of the Memphis Landing as a docking point for both large riverboats and private boats and the harbor area as a site for restaurants and shops. The 2008 Memphis Capital Improvement Project budget shows the total public cost of Beale Street Landing as $29,421,026 with $7,457,026 of that to come from federal grants. Included in the federal funding is $1M in 2004 Transportation funds under the Surface Transportation Program, $1,280,000 in a 2005 transportation appropriation under Ferry Boat Discretionary Program Awards, and $1,969,393 in a second transportation appropriation under Ferry Boat Discretionary Program Awards. 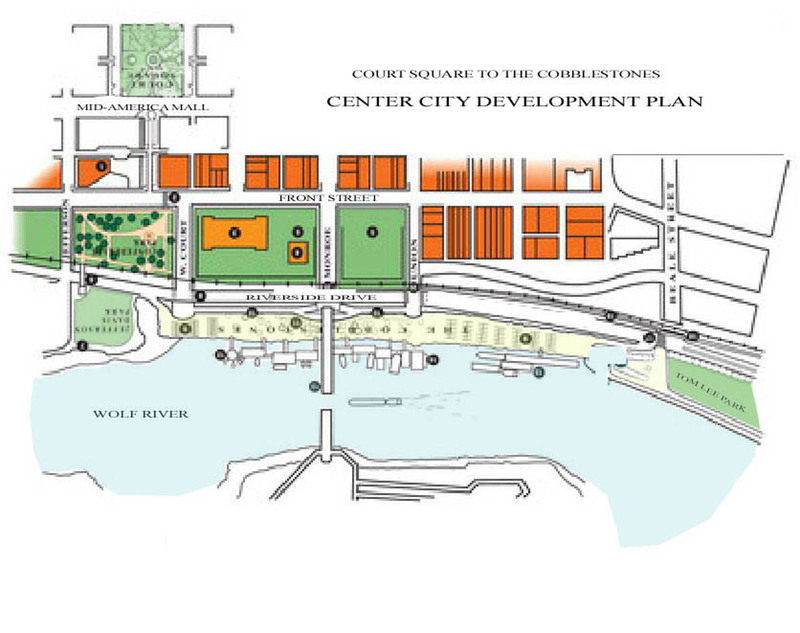 Location and design of Beale Street Landing as currently proposed. TN-SHPO’s comments on the adverse impact of the Beale Street Landing project. Minutes from TDOT’s consulting parties meeting. Mayor Joseph P. Riley’s visit to Memphis, here and here. Charles Jordan’s visit to Memphis, here and here. Fred Kent’s visit to Memphis and comments on Beale Street Landing, here, here, here, and here.